Home Basic Date Questions Questions using library methods How to compare two given dates in Java? Write a program in java that compare two given dates with all possible validations. We can compare two dates using following methods of Date class. 1) int compareTo(Date anotherDate) - It returns 3 values 0(zero), positive, negative. 0(zero) -> both dates are equal. positive -> first date comes after second date. negative -> first date comes before second date. 2) boolean after(Date date) - Test if this date is after the specified date. 3) boolean before(Date date) - Test if this date is before the specified date. How to check whether given date is valid or not ? // If Date is valid, converting String to date. * is false - It accepts only valid dates. * Regular Expression that matches String with format dd/MM/yyyy. 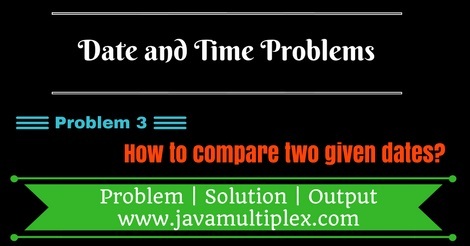 Tags : Date and Time problems, Date comparison in Java, String, Regular expressions, DateFormat, SimpleDateFormat, if else statement.